NORTH ANDOVER, Mass. - The Merrimack College women's ice hockey program opened its 2018-2019 season with a win over Union College, posting a 1-0 shutout victory Friday night. Goal #1 (MC 1-0) - The first goal of the season started and finished with senior Mikyla Grant-Mentis. After a blocked shot, a give-and-go with senior Katelyn Rae through the neutral zone saw the puck find Grant-Mentis's stick one-on-one with the last defender. A beautiful dangle set her apart, and after faking to her right, shot into the open left side of the net. The opening goal was marked just over two minutes after the first period started, giving the Warriors the early lead. Goal #2 (MC 2-0) - A power play goal for the Warriors doubled the lead with 10 minutes left in the first period. Freshman Julia Maclean and senior Emily Volpe went tick-tack-toe from the blue line to the slot, finding senior Dominique Kremer for the score. Goal #3 (MC 3-0) - The final goal of the game was a result was of a gritty play though the neutral zone. A Union back pass was nearly misplayed, allowing for senior Paige Voight to apply pressure and turn the puck over. From there, sophomore Megan Fergusson swooped in, taking the puck in all alone and finishing the play for the third and final goal. - Merrimack has taken the first game of the season two years in a row. - This season marks the first season that the Warriors have played their season opener in their home rink. 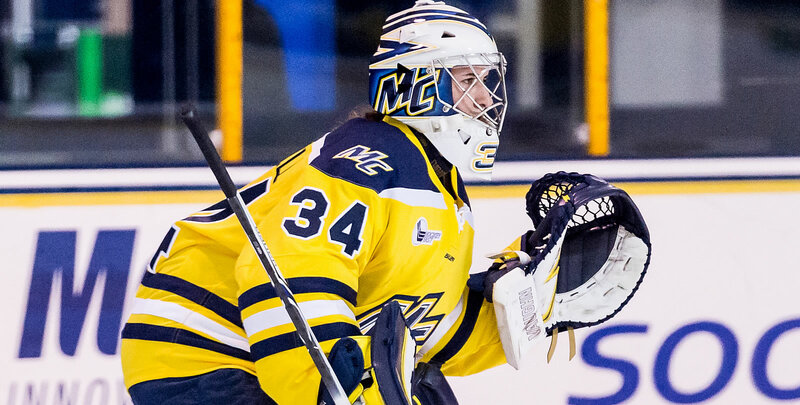 - Merrimack's last shutout came in a 1-0 victory over Princeton on November 24th, 2017. Merrimack and Union close out the weekend tomorrow afternoon, with puck drop inside Lawler Rink set for 3 p.m.